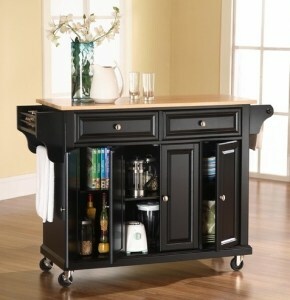 (7) A movable island is a fantastic way to add some much-needed counter and cabinet space. This classy Crosley Kitchen Cart with Wood Top ($329.99, on sale for $293.49) is made with a hand-rubbed finish and is constructed of solid hardwood and veneer. It has two deep drawers, a cabinet with three adjustable shelves, locking casters, spice rack, and a towel bar/paper towel holder. Love it!